The historic city of Trogir shows a medieval townscape on classical foundations that has survived almost intact into the 21st century. Trogir was founded by Greek colonists in the 3rd century BCE on a little island. It flourished under the Romans and expanded its power significantly under Venetian rule (13th 15th centuries). Trogir was my fourth WHS in a row during my short stay in Croatia, and honestly I didn't find it that special. Maybe some fatigue had crept in. But the Trogir cathedral looks a lot like the one in Sibenik. And those stoney, narrow backstreets I also saw in Split and Stari Grad. I even noticed the same black cat in several places, or was I just imagining that? The tourist hordes were here too. Trogir is close both to Split and to Split (Kastela) airport, making this an easy day trip for everyone. Focal point of attention is the Cathedral and the attached square, at which a number of monumental buildings are located. The Cathedral, like its counterpart Sibenik, has two lions guarding its front gate and similar statues of Adam and Eve. The pillars here are held by human figures that are supposed to represent Turks and Jews. The ICOMOS evaluation of this site hovers a bit between medieval city or urban continuity. The strongest aftertaste it left me with is 'Venetian / Italian'. I visited Trogir twice in April 2014. It has many Venetian buildings and unless you go for a stroll in the yacht marina in Ciovo you won't notice that it's an island! 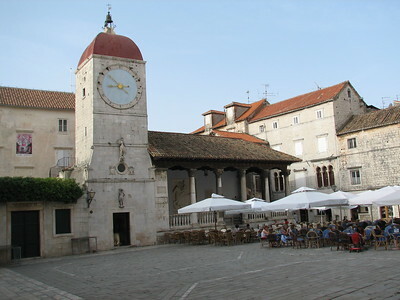 The main square has a splendid clock tower, a lovely town hall and a big cathedral with a beautifully carved entrance. Climbing the belfry is not something I'd recommend to those who are afraid of heights although the panoramic view from the top is worth the effort. The highlight of my trip was definitely the view from the Riva waterfront with the Kamerlengo Fortress which clearly exposes the several church steeples and towers present in such a small town. The only negative comment I have for such a quaint town would be to remove the ugly neon lights on the city entrances flashing UNESCO at night! It was a major minus point to me! A city to see for those who love surprises and unexpected things. The harbor full of old sailing ships is the biggest unexpected surprise. You can visit it in a day but it deserves an overnight stay to enjoy the tranquility that emanates during the evening walk. Trogir's historic centre enjoys a very scenic location on a small island between the mainland and the much larger island of Ciovo, and is connected to both by bridges. The historic monuments were all very pretty and interesting, but I really thought the location is Trogir's best asset. The Cathedral of St. Lawrence is the major attraction and features an impressive Romanesque-Gothic facade, but still resembles the cathedrals of Split and Sibenik. The Kamerlengo Fortress is also impressive, but doesn't seem to be open to the public. I also visited a small monastery with an art exposition. Trogir is always crowded with tourists, espcially cruise ship passengers, but also because of its proximity to Split and Split Airport (which is actually much closer to Trogir). 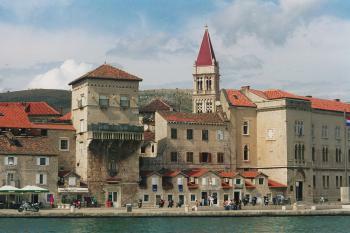 The historic town of Trogir is situated on an islet between the mainland and the island of Ciovo. It is about 500 meters long and barely half as wide. But there is everything you would expect from a historic town centre: a cathedral, a fortress, a city gate, city walls, some Romanesque churches, and houses and palaces from all periods: Romanesque, Gothic, Renaissance and Baroque. It is like an open air museum. The description on the UNESCO website states that Trogir is "an excellent example of a medieval town built" and "a remarkable example of urban continuity." This may be true, but I had rather the impression, that it does not add much to the previous inscriptions of Dubrovnik and Split. Nevertheless, I enjoyed to walk through the labyrinth of narrow cobbled streets and stroll along the promenade, especially in the late evening when there were less tourists. We took Trogir as our base to visit Sibenik and Split. We stayed at a small hotel on Ciovo, the photo shows the view from Ciovo to the old city of Trogir. This is a typical small town of the Croatian coast and islands, easily reached from Split and quite a contrast from it. It's a charming complex of lanes and streets and a great place to wander. Many of the major buildings surround the main square. Although, perhaps, it is the overall impression of the place that strikes the visitor, features like the west door of the cathedral - the remarkable Radovan's Portal - show why this town, rather than some of its neighbours in the region, can claim World Heritage status. Gates depicting Lions: The doors of Saint Lawrence in Trogir are flanked by Venetian Lions. 251 Community Members have visited.